The rising cost of fuel around the world is forcing logistics and distribution companies to find ways to reduce overall costs. While most companies have found ways to decrease packaging costs, warehousing costs and administration costs, transportation costs still remain a challenge! Learn how O2I’s Route Optimization Services can solve this problem. Route optimization helps businesses to bypass the issues caused due to inefficient route planning, and in streamlining their delivery and dispatch management systems for better gains. As your business grows, perfecting the route plan for your logistics division soon turns from an interesting affair to a meticulous one. With the help of Outsource2india's dynamic route optimization services, you can easily plan multiple routes and a variety of different schedules with hundreds of stops within seconds. Our route optimization services make use of cloud-connected software to help you automate delivery routes and manage your resource capacity efficiently, reducing costs by as much as 20%. 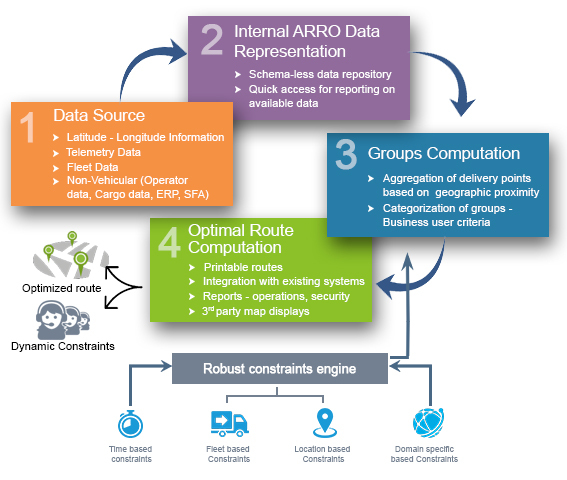 Our end-to-end solutions for route planning are derived from an optimization engine which is constantly powered by genetic algorithms and advanced machine learning techniques. A team of experts with experience in big data technologies, data science and data engineering ensure that all alternate transportation methods, related costs, and customer delivery windows are taken into consideration before planning a route. Once the routes are planned as per your requirements, our Automated Route Optimization system keeps re-optimizing routes in response to your input, the input received from your drivers/vehicles, as well as from the feedback received from your customers. Our route optimization system allows you to add or delete one or more delivery points at the last moment, even after your vehicles are out for delivery. Predictive traffic route optimization and recurring route optimization feature allows you to dynamically pick the most ideal delivery route, and assign or re-assign delivery routes quickly. This will reduce the delivery time, increase number of deliveries per day, and save fuel, cost and time. Delaying deliveries to go all the way back home to re-fuel not only leads to wastage of fuel, time, and money, but also leads to disgruntled customers. Optimizing fueling dynamically allows your vehicles to find the most affordable location in the vicinity to replenish fuel or gas. Our delivery route automation services help to optimize the cost associated with your freight carriers, number of visits, distance travelled, and the fleet size allowing you to achieve a measurable increase in your ROI. Customizable reports are generated as and when required allowing you to manage your agents in real time by setting estimated service, pick up and drop off quantities, etc. Who Needs Our Dynamic Route Optimization Services? Collection of Data - We collect information regarding your existing route systems in place from multiple sources such as from the latitude-longitude information, telemetry data, existing fleet data, and other non-vehicular data such as operator an cargo data, ERP, SFA, etc. Groups Computation - Once the data has been collected and identified, we aggregate delivery points based on their geographic proximity. Thereafter several groups are created based on client-defined constraints such as time-based ones, fleet-based constraints, location-based constraints, etc. Computation of Optimal Route - Our team helps to create the optimal route for your fleet which integrates with your existing systems, while allowing for 3rd party map displays on phones, tablets, etc. for easy access. This optimized route takes various real-time factors in consideration, and once again, based on constraints, delivers the ideal optimized route in a very short time. Throughout the entire process, we follow all stages of testing that a software solution should undergo before it is deployed in a production environment. At each and every stage, we ensure that all identified stakeholders are alerted when system reports a confidence level lower than benchmark we are trying to achieve, ensuring measures are set in place so as to prevent it from happening again. These alerts can be sent via email or other real-time notifications to all the personnel involved. Automated Planning and Optimization - Our route optimization services help to ensure that all variables such as resource capacity, route planning, and real-time events are evenly checked by our automated programs so as to ensure an optimum experience for our clients. Real-time Tracking - We offer last-mile tracking in real time on an interactive map interface, which can further be shared with the help of secure links or by using iOS and Android push notification APIs. We also offer real-time updates to ETAs based on varying road conditions. Hardware Independent Solution - Unlike most other software available in the market, our cloud-based solution ensures that you can use it on device hardware ranging from desktops to phones without affecting your battery life. Dynamic Re-routing - Since our algorithm takes into consideration several real-time variables such as trend lines, traffic conditions, resource capacity, etc. we can re-route your fleet in real-time thereby saving time and money. Interactive Dashboards - Our interactive BI dashboards help you to analyze the entire delivery chain for problems and missing optimizations, and offers extensive planned vs actual SLA comparisons. Cost Efficiency - We offer infinitely scalable architecture and resource-effective solutions at a fraction of the price as compared to most of our competitors. On an average, you can save 30% distance and see a 20% reduction in number of routes as well as observing a 25% saving on time to travel. Easy Integration - With the help of our REST APIs you can integrate real-time routing updates to an application of your own choice without having to spend hours on developing a new application from scratch. Around-the-world Coverage - Since all our route optimization services are geocoded and powered by open source public map data, we can cover your fleet over the entire world. Increased Efficiency - Our en-route automation services means you have fewer vehicle fleets to handle, while gaining the ability to increase the total number of deliveries in a day. Complete Data Security - For solution on cloud, our team follows strict user management guidelines and stores the data in a secured environment. We ensure that the data uploaded on the cloud cannot be accessed by a third-party requester and hold the option to purge data on user requests. State-of-the-art Infrastructure - We have the required infrastructure in place to provide the best possible services to all our clients and address even the most complex route optimization requirements successfully. Additionally, we leverage a third-party hosted Cloud-based infrastructure, which is administered in-house. Ease of Reporting - Our automated solutions ensure you always have access to high-quality reporting capabilities thereby driving real-time decision-making. O2I Assisted a Leading Dairy Brand in the Middle East With Route Optimization and Dynamic Routing. O2I Assisted a Leading Dairy Brand in the Middle East With Route Optimization and Dynamic Routing. Read the case study. O2I Helped a Logistics and Security Services Company Dynamically Collect Telemetry Data from Vehicles Read the case study. With an experience of more than 15 years, and with our stellar background in providing high-quality data science services to clients across the globe, we can confidently state that our delivery management services will help you deliver in a planned and cost-saving manner. We are the forefront of enterprises offering route optimization services in India and with a team of big data technologists and data engineers, we help to create automated workflows which are tailored to the way your delivery fleet functions. If you are looking for a service provider who can help you maximize your resources by delivering in the fastest manner and in the shortest time possible, then you have come to the right place. Contact us right away and learn more about our services!